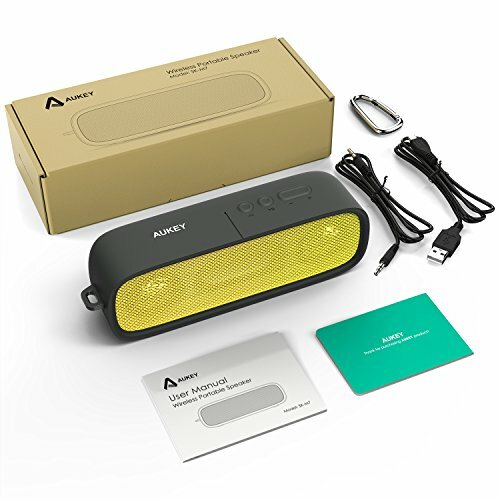 The Aukey SK-M7 Premium Stereo Bluetooth Speaker boasts a robust sound from a compact and portable size. It's supported by 3W drivers, offers high clarity and balance, and features the latest Bluetooth 4.1 technology to connect to your smartphone or tablet within 10 meters of operation distance. As far as budget Bluetooth speakers go, this one doesn't leave you wanting much more. So, how does it sound, and will the Aukey SK-M7 speaker compare to its competition? The Aukey SK-M7 is a fantastic speaker for its purpose. It is portable, measuring only 5x10x10 cm and weighing only 383 grams. It's sturdy enough to take outdoors and comes in a few different beautiful design schemes. Even if your device doesn't have a Bluetooth function, you can use the SK-M7's 3.5mm AUX Input to send your favorite music to the speaker. The rugged silicon rubber case is detachable, and the aluminum metal carabiner adds the perfect option for both indoor and outdoor activities. The speaker packs a high capacity rechargeable 2600mAh Li-ion battery that supports up to 14 hours of music at 80% volume. Recharge in just 4 hours using the included Micro USB cable. USB A to Micro B charging cable. Stereo 3.5mm male to 3.5mm male cable. Enjoy the sound quality and performance as you listen to tunes with this little cannon of a speaker. While it might be small in stature, it makes up in volume. In fact, no matter how high you crank it, you never have a reduction in quality at higher volumes. It's not just for listening to music, either. You can use this portable gem while watching movies on your tablet and phone and when connecting with friends and family overseas. Overall, the performance far surpasses the expectations you may have of a discounted Bluetooth speaker. Seeing as this is Bluetooth speaker, it would behoove me to dive into the ease of use. 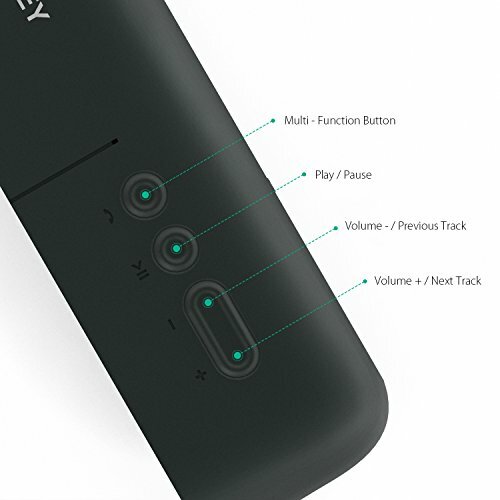 To connect the Aukey speaker via Bluetooth, all you need to do is flick the power switch near the back of the speaker to the "on" position. A little jingle followed by a high pitch beep will play through the speaker. When the speaker is switched on, it will automatically enter the pairing mode with a small flashing light on the top. Next, enable Bluetooth on the device you wish to pair with, and the speaker will show up in the devices list as Aukey SK-M7. Select this, and within a few seconds another high pitch beep will play from the speaker, the light will cease flashing, and it will show as connected on your Bluetooth devices list. Automatic pairing will take place after this process is completed the first time, and that's where this speaker's technology really shines. You can also take your phone about 33 feet from the speaker and still maintain the music, movie, or phone call you're having. The connection is lightning fast, and it holds sturdy and sounds fantastic, to boot. When used indoors with a direct line of sight to the audio source, the speaker handles a distance of 33 feet without a problem. Even with some obstructions in the way, the speaker can hold strong to the Bluetooth signal. When you take the speaker outside the designated range, it cuts out abruptly, but the good news is that when you walk back into range, it reconnects automatically, stuttering a little when doing so. The range of the Aukey SK-M7 is about average when compared to similar Bluetooth speakers in the same price range, and that's a good thing. Sure, it would be nice if it was a little longer, but 33 feet is plenty, especially if you're using the speaker outdoors and have it clipped on the carabiner. When set to 50% of the volume, the sound is crisp, and everything rings in true. However, it may be a little low on the bass, which is to be expected with a Bluetooth speaker of its size. While it produces 6W, it cannot be understated how much sound this tiny speaker is able to produce, even when compared to larger speakers. Unlike smaller Bluetooth speakers, especially in its price range, the Aukey SK-M7 prevents itself from degenerating into noise and distortion at higher volumes. The sound quality does well in the mid and high ranges. While the bass is a little underwhelming, the speaker's sound quality measures up to speakers twice its price. As far as stretching your dollar, you can't do much better than this speaker. While making phone calls, the caller's voice sounds loud and reasonably clear. There was no echo, which can be a big problem with Bluetooth speakers during a call. The audio quality of the voice through the speaker is crystal clear with no interference, echo, or distortion. This means fantastic sound quality for the price of the speaker, in both music and phone calls. Feature reviews have continuously exceeded expectations of the Aukey SK-M7 performance, compared to other competitor speakers in this affordable price range. The Aukey SK-M7 is fairly rugged by design. The speaker is entirely covered with a matte black rubberized silicone, except for the ports on the rear, carabiner mount, and the speaker grille. While you can expect to leave a few fingerprints on it, the speaker is protected against knocks, bumps, scratches, and even drops from a short distance. There’s a plastic loop on one end for attaching to the carabiner. The grille is removable, but if you take it off, the buttons may be easily damaged. A top-mounted LED indicator indicates the charge and connection status. 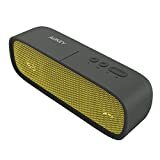 This Aukey speaker is currently selling at around $30 - $50 on Amazon, which is an absolute steal for the quality of the speaker. The Aukey SK-M7 is shipped inside of a rectangular shaped brown cardboard box containing product information, illustrations, and safety certifications. The box is shrink-wrapped in plastic. Inside, you'll find the Aukey SK-M7 Bluetooth Speaker wrapped within a plastic bag and held in place by an internal cardboard insert. The speaker comes with a jack-to-jack cable, USB cable for charging, a carabiner clip for camping, and the expected paperwork. Overall, it's well packaged. Anker's SoundCore outputs more music and less noise while sounding both great and loud. Its battery keeps your tunes playing for up to 24 hours on a single charge. This speaker utilizes Anker's patented sound technology, featuring dual full-range drivers and a unique spiral bass port. It also has carefully designed transducers keep total harmonic distortion below 1%. Like the Aukey Sk-M7, it produces 6W from a dual driver, features low harmonic distortion, a patented bass port, and a built-in microphone for calls on the iPhone, iPod, iPad, Samsung, LG and other phone devices. Overall, this Anker speaker really gives the Aukey a run for its money. 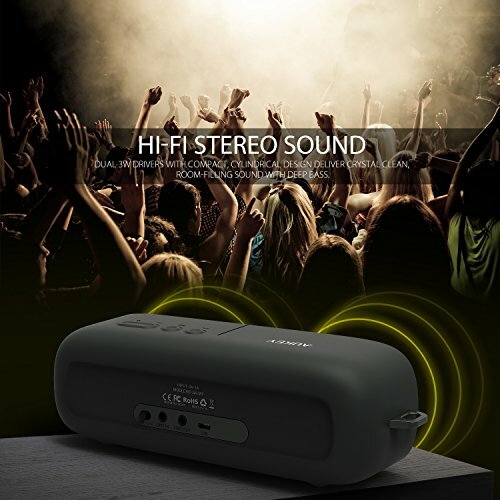 Where it loses points, however, is that it is not as durable, and has less Bluetooth connectivity options compared to the Aukey SK-M7 Bluetooth speaker is quicker. It has the SK-M7 beat on battery life, but unless you're planning on jamming out from dusk till dawn, they are both great in that department. Well built, but not very rugged. Stream music, podcasts, and more from your smartphone or other compatible devices with the Amazon Basics Portable Bluetooth Speaker. Offering a wireless range up to 10 meters, the rectangular-shaped cordless speaker makes an ideal choice for streaming audio when working in the yard, camping, hosting outdoor parties and indoor soirees, or relaxing at home. It features two internal 2.5-watt speakers and two full-range drivers for high-quality sound, providing rich bass without distortion, even at its highest volume. 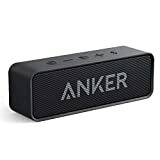 Like the other Bluetooth speakers on this list, it features a 3.5mm aux-in jack for connecting non-Bluetooth audio devices. Its rechargeable battery allows for up to 8 hours of playtime on a full charge, and it is portable, small, and lightweight for take-anywhere convenience. As is essentially required by a Bluetooth speaker these days, it also has a built-in microphone for hands-free speakerphone calling. Overall, for an Amazon Basics product, this speaker can hold its own, but it's not in the same class as the other speakers reviewed here. It doesn't seem like much thought was put into the build. Nothing to write home about. ZoeeTree Bluetooth 4.2 Wireless Speaker features advanced digital sound, noise/wind reduction technology, and is overall unique loudspeaker cavity structure to deliver premium acoustic sound, crystal clear balanced bass. 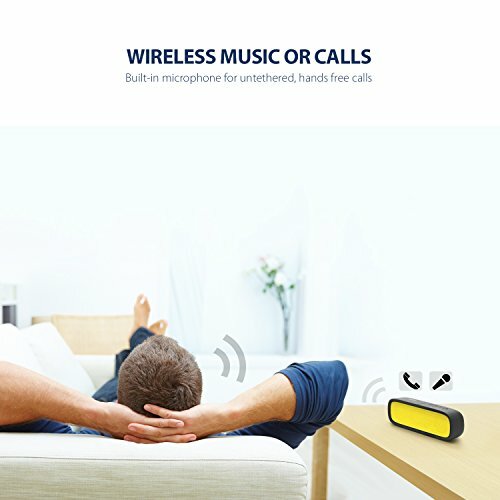 You can connect two ZOEE Bluetooth speakers and connect them together to create left and right channels. Enjoy 10 Watts surround sound after pairing, 4.2 Bluetooth technology, and up to 6 hours of uninterrupted playback. It has a built-in rechargeable 1800 mAh lithium-ion polymer battery that can provide up to 6 hours of endless playback, which honestly isn't that impressive considering what else we have compared it with. It has an aluminum body and is lightweight enough for traveling, weighing just under 10 ounces. Interestingly, it also has a built-in Micro SD TF card slot and FM Radio, so you might be able to listen to a ball game while you're on a hike! Overall, this is a good speaker to bring with you on a trip, especially with the FM Radio option, but if you will be out all day and want to list to some tunes, consider a different option with a longer battery life. Easy to use, connects right away and holds the connection to Bluetooth. Doesn't seem overly durable, and the grille isn't easy on the eyes. While you can't compare a Bluetooth speaker to a desk or bookshelf speaker regarding sound quality, you can still have high expectations for a portable speaker in today's world. The Aukey SK-M7 Premium Stereo Bluetooth Speaker is not only portable and solidly built, but it provides excellent audio playback. 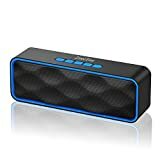 Even better, you can have your jams playing loudly for an entire day out on the town on a single charge, and the same can not be said about many other Bluetooth speakers in a similar price range. Will this speaker tear down the rafters and give you jaw-dropping bass? Probably not. But, that's not why you are getting a Bluetooth speaker, anyway. The key to this righteous little speaker is its portability and impressive sound quality for what it is. For about $36, the Aukey SK-M7 Premium Stereo Bluetooth Speaker isn't just worth it, it's one fantastic bargain.